Your deck is your paradise. Like a paradise, it should be beautiful and it should be built to last. As you begin on the journey to building your own paradise right in your backyard, the first thing you need to consider is the kind of material you’ll construct this paradise out of. The choice in material is crucial for both the look and LIFESPAN of your deck. All decking materials cost different price ranges, and they all require a different amount of upkeep, and they all look different. You need to consider all of these factors as you proceed to get your deck constructed. But how do these factors vary among the different deck building materials? To find that answer, just read ahead, and we’ll describe some of the most popular deck materials and their different features for New Jersey deck building projects. Pressure-treated lumber is the most popular material used for decks, and the reason why is clear: It is among the most affordable materials available, with prices averaging from 60 cents to a dollar per linear foot. Pressure-treated lumber can easily splinter and crack and warp. Consequently, you might find yourself paying more in the long run as you replace and repair the material. A pressure-treated lumber deck can come in a wide variety of different colors: shades of gray, red, tan, sand, etc. You can finish them with a high gloss or none at all, allowing your deck to have a simple, rustic look or a much more refined, elegant one. Whatever you decide, a pressure-treated lumber deck provides ample options to suit your tastes and your home. Redwood costs about three times that pressure-treated lumber does, so the initial cost can be substantial. In addition to that expense, redwood needs to have a finish applied to it every few years — an expense which can build up over time. 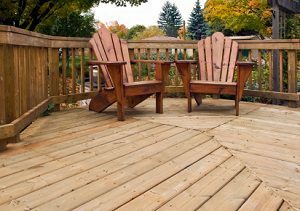 As mentioned above, a redwood deck requires a regular coating of finish. And if you want to preserve their striking natural colors, you’re going to have to apply a stain at the start. Redwood is — of course — RED. So there’s not the color variety in it that you get in pressure-treated lumber. However, for what it is, redwood is GORGEOUS, and it will complement just about any home or business beautifully. Composite lumber costs a little over twice what pressure-treated lumber costs but less than redwood costs: about $2.50 a linear foot. However, after the initial cost of installation, the material will pay for itself over time. How so? Since composite materials are made from, among other materials, plastic, they do not split, splinter, warp, or rot. Thus, you can expect to set it and forget it with a composite material. No weak materials and annual coatings to keep picking away at your wallet for the rest of this deck’s life! Since composite materials are plastic, they can come in a HUGE variety of colors. So if you find that your bright purple house doesn’t QUITE go with your redwood deck, you might find that an orange-painted composite might be more for you — and at a smaller price, no less. Aluminum costs about $9 per linear foot — the most expensive option listed. But if you can endure that initial cost, an aluminum deck, like a composite, will pay for itself over time because . . .
Like composite materials, aluminum won’t splinter, crack, decay, or become infested with termites or other pests. And as it is even stronger and more fire resistant than composites, it will endure through even the worst weather conditions — another money-saving benefit. Aluminum decks can be painted a variety of colors. They can even be painted to resemble traditional wooden decks. So in addition to an aluminum deck’s longevity, you can enjoy a beautiful faux redwood deck . . . or that bright orange one, should that suit your taste. With regard to the cost, upkeep, and of course, look, you want to be sure that whatever material you choose is the best deck for yourself and your home. And with this handy guide, you should be more than prepared to make the best decision possible for you AND your house! Once you’ve decided upon the perfect material and are ready to build your dream deck, don’t hesitate to give the expert New Jersey remodeling contractors and deck builders at Campbell’s Construction a call for excellent, affordable deck-building services: 732-623-9790. 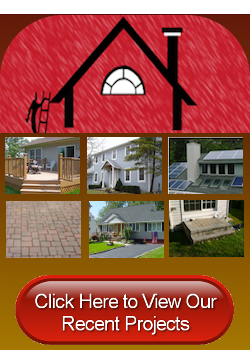 Do you need a new deck in New Jersey? 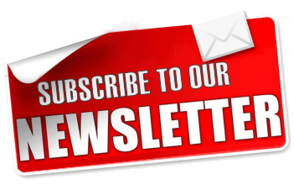 Call 732-623-9790 or complete our online request form.